It’s planning and budgeting season for many marketers. Whether you are embarking on a first-time initiative or building on a long-standing program, justifying content spend typically requires numbers. 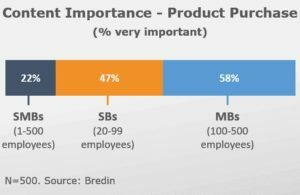 Bredin’s SMB research can help. Use the following data to make your case. We surveyed 500 SMB principals in December, and the results tell a strong story about the essential role content plays in driving awareness, enabling research and closing sales. When it comes to learning about new products and services for their business, 21% of SMBs say they rely on cont ent as a source of information. However, the importance of content increases sharply with company size: 51% of SMBs with 20-99 employees rely on marketing content to learn about new offerings for their business. For companies with 100-500 employees, it’s 59%. The bigger the SMB you’re targeting, the more responsive they are to content marketing. Likewise, content is key to helping SMBs research your products and services, and determine the fit with their business needs. Overall, 25% of SMBs – 49% of companies with 20-99 employees, and 56% of those with 100-500 employees – rate marketing content as very important for researching products and services. Content closes the sale. Don’t believe it? Ask the 22% of SMBs overall – or better yet, the 47 % of businesses with 20-99 employees, or the 58% of companies with 100-500 employees – that say content is highly important in helping them make a purchase decision. Want to know which elements work best at each stage of the sales cycle? Watch our Fastcast Moving SMBs through the Sales Cycle with Content or view the deck. Brand perception: 71% of SMBs agree that marketing content makes them think more favorably of the sponsoring company – and that jumps to 87% of SMBs with 20-99 employees, and 89% of SMBs with 100-500 employees. Sales: 60% of SMBs agree that marketing content makes them more likely to buy from the sponsor. That percentage is much higher among larger SMBs: it’s 73% of SMBs with 20-99 employees, and 80% of SMBs with 100-500 employees. In fact, 37% of SMBs overall say they have made a purchase specifically because of a company’s business management tips and advice – jumping to 44% of companies with 20-99 employees, and 60% of companies with 100-500 employees. Retention: 67% of SMBs agree that marketing content makes them more likely to remain a customer of the sponsor – including 80% of companies with 20-99 employees, and 73% of companies with 100-500 employees. The takeaway? Content works! It’s a cost-effective way to drive awareness and sales, and should be a key part of your 2019 SMB marketing toolkit. Our team of award-winning SMB-focused writers, editors, researchers and strategists can help you craft a strong strategy. When it’s time to create content, our team can quickly and expertly deliver the content you need to achieve your goals. Contact Bredin at info@bredin.com.